Drop — Having problems connecting? Try this troubleshooting guide. 1. Make sure that the device you are trying to connect to is compatible with Drop. For a list of compatible devices, click here. 2. Now, open Settings on your iPhone or iPad. If Bluetooth isn’t already activated, toggle the switch to enable it. 3. Make sure that you have the latest version of the Drop Recipes app installed by visiting the App Store from your device. 4. 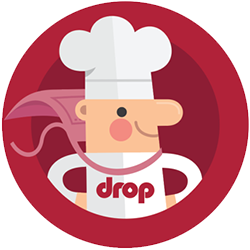 Open the Drop Recipes app. 5. Tap the front button of Drop Scale. This should cause a red LED light in the center of the button to pulsate briefly. Can’t see a LED light? Please follow these instructions. 6. Open the Kitchen screen from the bottom navigation bar, where you should be able to see and select your Drop Scale. Try pressing on Drop Scale to apply some weight, and watch the weight reading change in the app. This means the scale is connected to the app. If nothing happens, perform a soft reset of your Apple device and try again. 1. Make sure that the device you are trying to connect to is running Android 5.0 or later. To check this, follow these instructions. 2. Now, check that you have Bluetooth turned on. Swiping down on most devices will open a menu that shows a Bluetooth icon. If it is not highlighted, tap it to enable Bluetooth. Alternatively, you can turn Bluetooth on by going into Settings and toggling the switch next to Bluetooth to On. 3. Make sure that you have the latest version of the Drop Recipes app installed by visiting the Play Store from your device. 6. Open the Kitchen screen from the bottom navigation bar, where you should be able to see and select your Drop Scale. Try pressing on Drop Scale to apply some weight, and watch the weight reading change in the app. This means the scale is connected to the app. If nothing happens, turn your device off and then on and try again.